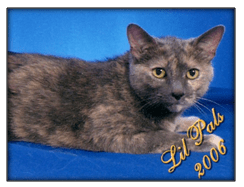 Lib was a beautiful cat with a slick grey coat mottled with patches of buff and orange. She was sleek and lean with long graceful legs and paws and a delicate pointed face and ears. She was so slender and graceful she reminded me of a model wrapped in an expensive, one-of-a-kind fur coat. Her official name was Olivia Orange named after a character I was playing in a local play and for the orange patches throughout her fur; but, we always called her Libby or Lib. I first saw her at the dog groomer’s office where she was snoozing in a patch of sunlight with countless people and dogs walking over and around her. I thought she must be a pretty laid back cat to allow all that chaos around her without moving. Little did I know then that she was just displaying her stubbornness to claim her spot and refuse to move. I picked her up and she immediately snuggled into the crook of my neck. The groomers all cooed and awed and said she had never done that with anyone else. I thought they were just telling me that so I would adopt her. She was among a litter that had been anonymously dropped at their doorstop so I decided to take her home. Unfortunately her personality didn’t match her outward beauty. She was independent, more so than the average cat, stubborn, sneaky, and haughty. She was the queen of the house and she let you know it. She would walk through the living room with her head held high, stop and survey the room, arch her back and look down her nose at the lesser humans and animals in the room, then exit with a swish of the tail. She was very seldom affectionate or playful, she just couldn’t be bothered with such foolishness when a secret cozy nest under my good blankets was waiting for her. She couldn’t lower herself to chase a silly feather at the end of a stick and don’t expect her to kill a mouse. I once had a mouse in the house which I managed to shoo into the enclosed porch. I then turned Lib out on the porch expecting it to be turned into mouse burgers quickly. They eyed each other for some time and when the mouse decided to make a run for it by going straight under her belly she jumped five feet into the air. The only time she lost her cool was in the presence of cat nip. Then she would roll and drool like a sloppy drunk. However, she did have one outstanding trait—she could count. When we traveled we would leave enough dry food and water to last until our return. When we came back we were greeted with her catnip mice in her bowl—one for each day we were gone! I don’t know how she did it but she was always right on the number of days we were gone. Lately, her age was beginning to show. Her fur stood on end and was not as neatly groomed, she slept more often, and she had even become docile. Her time had come so yesterday we paid a visit to the vet’s office. There they have a special room for those who have reached the end of their journey. It is softly lit, equipped with comfortable chairs and couch, a big pillow on the floor, and scented candles burning. The walls are lined with pictures of some of the others who have passed through this room. She nestled calmly in my arms and when the drugs were administered into her veins she looked me straight in the eyes and then went limp. There was no pain or restlessness—just peaceful, calm sleep. Rest in peace dear Lib. Hopefully she is now sleeping in a sunbeam and running through fields of cat nip. We will miss her aristocratic touch. Below is a remembrance of Libby that the vet’s office sent. 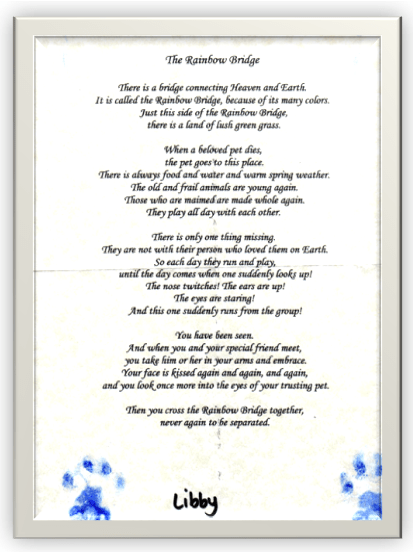 I love the story of the Rainbow Bridge and, someday, I will have lots of furry friends to greet me when I’m ready to cross that bridge. Yep can’t even look at the poem without tears in my eyes….. So sorry… Not an easy thing to do. Thank you dear friends for your messages of condolences. All pet lovers understand the pain and anguish involved in making such a decision. I have had to put down a number of pets down over the years and it never gets any easier. I had to put down my 12 yr old Maltese (Duchess) last month due to cancer and I miss her so very much, Sorry about Lib. So sorry to hear about your sweet dog Duchess. It is always a hard thing to do to put them down but remember–that is the best thing we can do for them to stop their suffering. If you are looking for a new dog I recommend going to your local dog shelter or a rescue group. There they can tell you about their personalities and you can adopt an older dog that is already house trained and not as active (or destructive) as a puppy.